Understand how the internet began and enabled the Peer-to-peer communication, leading to the creation of Bitcoins and Blockchain, a financial technology (fintech) that promises to make a splash. The internet, an essential part of our everyday lives, had its origins in the end of the 70s with an innovative concept. It would be an open network infrastructure that would allow you to connect with other networks, without the presence of a government agency or centralized organization, only with the basic rules and definitions necessary to ensure communication between everyone. With the arrival of the World Wide Web (WWW), the internet gained mass appeal outside of its birth environment (military and academic), and became the large global communication network that we know today. Several requests for file exchanges and remote access emerged surrounding this open infrastructure, but at that moment in history, computers were divided into two large groups: servers and clients. The vast majority of internet users were clients accessing the information available on servers, who centralized the distribution of information over the network. This division was broken with the introduction of Peer-to-Peer communication (P2P). It is an architecture of computer networks, where each one of its points or knots functions both as a client and as a server, allowing for services and data to be shared without the need for a central server. P2P was initially created with the intent to facilitate the exchange of music over the internet. In this type of communication, the spirit of decentralization reached a new dimension: all the computers act as servers and clients, performing the exchange of information in a totally open and democratic manner. The trend of using distribution instead of monolithic systems has allowed information networks to grow, becoming larger and more powerful. While the networks grew, P2P applications developed and awakened the interest of users. Applications like Napster, Grutella and Kazaa became famous because they established a subset of the P2P technology that was at the fingertips of thousands of users. In our blog we have already explained what this multimillion dollar technological area called fintech is. The financial technologies, as we have explained, make up some of the most important initiatives in the area of digital finance today. P2P was essential in technologically revolutionizing this area, allowing for possibilities like Bitcoins. 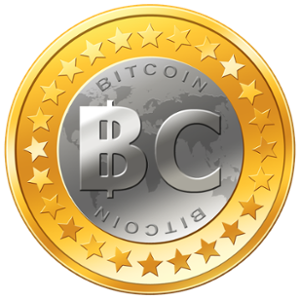 The Bitcoin is a virtual currency based on the P2P system, meaning it does not have a centralized authority controlling its value or transactions; all these tasks are undertaken by the internet. Virtual stores that sell this cryptocurrency (a form of exchange that uses cryptography to safeguard transactions and control the creation of new units) already span the globe. The cryptocurrency acts as an online payment system based on an independent, open code protocol, allowing for transfers via a computer or smartphone without the need for a financial institution to act as intermediary. What is the Blockchain and how does it fit into this story? As in any monetary system, with the use of virtual currency there is also the need to keep a record of the transactions so as to offer guarantees, which are traditionally offered by the traditional banking system. Keeping a record of the transactions and certifying the value of the money are the reasons behind the arrival of the Blockchain, a totally decentralized mechanism based on P2P technology. The concept of Blockchain is that every transaction carried out online is retransmitted to the largest possible number of computers. 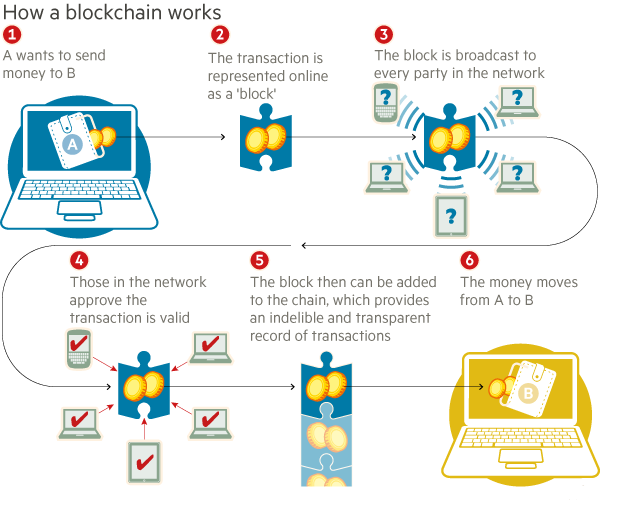 When a computer has already received a good amount of transactions, it gathers all open transactions into a single block and begins to attempt solving a difficult mathematical problem, based on the values of the transaction block. When a computer solves the problem, this transaction block Is considered valid and distributed to the other computers in the network. The fact that the mathematical problem is difficult makes it unlikely that two computers will create a valid transaction block before it is distributed across the internet. As the name Blockchain suggests, these blocks are then linked in a chain, meaning that a new block is created in reference to a previous valid block. With this linking process, the most recent blocks can actually run a small risk of being invalidated if more than one computer solves the mathematical problem simultaneously, but the older blocks are made safer with the creation of new blocks based off of them. In Bitcoin’s Blockchain, for example, which uses millions of computers worldwide, only one computer is able to solve a mathematical problem every 10 minutes on average. For those who seek total security in their transactions, a 60-minute wait is recommended to ensure beyond a doubt that the present transaction will not be invalidated. The first major challenge Blockchain poses for banks is in eliminating the concept of an institution that provides credibility to financial transactions, making the existence of a bank as an intermediary in a financial transaction unnecessary. At the same time, the process allows for a series of opportunities. Firstly, there are huge redundancies and costs associated with IT simply to ensure a record of bank transactions. With the Blockchain’s distributed infrastructure, the cost of storing the transactions will be reduced. The concept behind the Blockchain is not restricted to monetary transactions, since, deep down, it is a record of a commitment between two parties. In other words, it can be used in any trade operation, even replacing contracts of any nature. Many banks are still trying to understand the impact created by the Blockchain in their operations, and are studying opportunities for cost reductions, better understanding of the client, and the impact in their profit margin with the possible erosion of bank transaction costs. There are several initiatives related to this. Another important fact is that Blockchain transactions are open and everyone has access to the interactions of participants, which makes it possible to gain a better understanding of the client. – Goldman Sachs created a US$ 50 million research fund to test the use of a digital currency to pay individual clients. – The Commonwealth Bank of Australia partnered with an open source provider of a Blockchain platform to create a payment system between its subsidiaries. – Some banks, like UBS, JPMorgan, Société Generale and Barclays are working with startups in incubators. How about you? Are you already familiar with Bitcoins and the Blockchain technology? Share your experiences with us!